The bindi is an iconic Indian tradition that has been passed down for centuries and is layered with meaning. 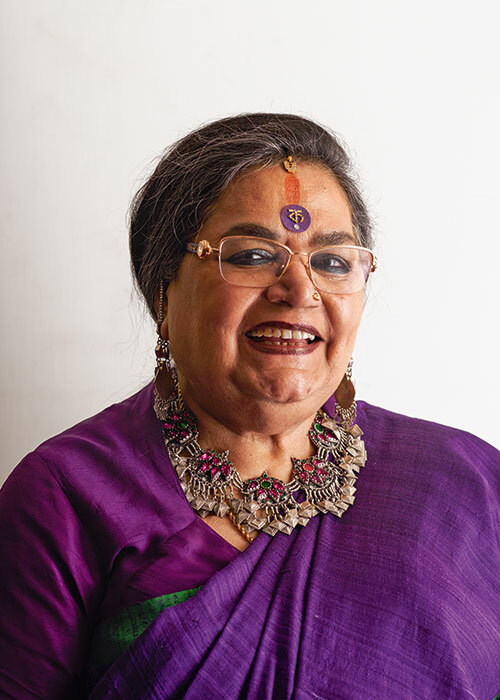 In the first of a three-part series, we speak to Usha Uthup who has staunchly stood by this form of adornment and made it her own. Once upon a time, the bindi was almost as omnipresent a marker of Indianness as that much celebrated custodian of our culture — the sari. Perhaps the most low-maintenance of our traditional decoration customs, wearing a bindi —like the sindoor, mehndi or aaltaa — is a quintessential Indian practice. Texts dating back thousands of years count these among the solah sringaar, the 16-step bridal hack itemising all the various essentials required to ‘get the look’. And occupying a position of privilege here in this age-old checklist is none other than the humble bindi. The word ‘bindi’ is derived from the Sanskrit ‘bindu’, which means dot or drop. Central to philosophical and cultural iconographies, the bindu is a powerful visual trope, with an ocean of meaning attached to it. And it has intrigued and inspired many who have made it their muse, often with a desire to celebrate or reinterpret it. But for centuries, the bindi lived within a rigid framework of societal codes. Only monogamous Indian women could mark their foreheads with a red dot of sindoor; proudly announcing their marital status, and role as protector of progeny in a Facebook-less era. Over time, it came to be regarded as auspicious, and as a symbol of security and status. Like most practices with ancient roots, it too serves a spectrum of purposes. In Hindu religion, it is said to represent Shakti or divine feminine power. It has the power to ward off bad luck, which is perhaps where the concept of the black dot or nazar ka tika originated from. Spiritually, it is supposed to represent our ‘third eye’, one that can only open after years of meditation. But by the second half of the 20th century, the DIY ethos was quickly losing ground with urban Indian women. And in came the new-and-improved pre-made stick-ons to fill the market gap and save the day. A common reference point across classes and societies, both contemporary and ancient, this visual vestige of the Vedic times has adapted and evolved in order to survive. Today, it doesn’t matter if the wearer is married, unmarried or widowed — while a widow in India wouldn’t normally apply sindoor in any form, the stick-on bindi is fair game. In a way it is empowering. Women now have unchecked access to the accessory in many colours — finally there is a guilt-free alternative. And so, the bindi has acquired a new meaning in an updated context, where it shifted from being a signifier of marriage and religion to a fashion accessory. So, in a sense the bindi is every bit an anti-trend. Any fad integrates you into the commercial, production-driven fashion machinery and the conformist value system it represents. But with the bindi — basking in its central position on the forehead — it’s the exact opposite: you’re free to inoffensively set the terms and conditions. As products of globalisation, many of us are in a privileged position today — we can choose to owe allegiance to only those cultures that resonate with us. Whether we want to reject the bindi or accept it as a part and parcel of festival fashion 101; connect to it on a deeper level as an embodiment of our cultural identity; or assign it religious meaning; the choice is ours. Personally I do occasionally abandon the bindi when I feel it might alienate me in a certain setting. And so I’m curious to find Dubai-based Canadian-Indian fashion influencer Neha Oberoi going by the handle @scarletbindi on Instagram. “I opt for a bindi only during Indian events or weddings unlike my mom who wears it on a daily basis. But I wanted a name that signified my Indian heritage, was feminine and also said ‘fashion’, and I felt this one fit in perfectly,” she replies on the social media site, confirming the custom’s relevance and nostalgic value even to diasporic communities. Like Oberoi, I am not compelled to constantly project my ethnic identity. I believe vetoing or endorsing a bindi — and the fashion in which I do so — is a private decision driven by my personal style, mood and comfort level. But more on that later. Right until the late ’90s, when it started raining brands, Bollywood heroines would flaunt the bindi with abandon. Divas Meena Kumari and Rekha were almost never seen without one on-screen; and the former’s big red bindi and Rekha’s smaller version also found favour with the heroines off screen. While superstar Vyjayanthimala opted for the sober circular kind in her younger days, she has created her own trademark now: a large red circle with a straight line protruding from its centre to the top of her forehead. Sridevi could be credited for setting many a trend in the ’80s and ’90s: from her matching pastel bindis in Chandni (1989) to her vibrant teardrop-shaped ones in Nagina (1986). In English Vinglish (2012), her middle-class housewife Shashi opts for the most common variety prevalent among the middle and lower classes in cities and certainly the interiors: a simple red dot (implying that she is a coy married woman whose life is consumed by familial duties and responsibilities). References to the bindi have not been restricted to the sartorial department. Amitabh and Jaya Bachchan lip-synced to Teri Bindiya Re (where the lyrics went Sajan bindiya le legi teri nindiya, Re aay haay, Teri bindiya re…. ), a song about the sensual appeal of the bindi, in Abhimaan (1973), where the Bachchans, then newly married, played a newly married couple. And it was not the first of its kind: only four years ago, in 1969, Lata Mangeshkar had sung another song about the accessory — Bindiya Chamkegi, for the Rajesh Khanna-Mumtaz starrer Do Raaste. One reason why the bindi hasn’t taken over more foreheads outside the country is because it is so very Indian; conceptually, it doesn’t share common ground with any other culture. And exoticism comes with a shelf life, only lasting as long as it takes for the novelty factor to wear off. Pop star Selena Gomez, who took the politically incorrect call of casually posing in a bindi at Coachella a few years ago, was lambasted for seemingly trivialising and superficially engaging with a culture. After all, ‘cultural appropriation’, quite the catchphrase in these easy-to-offend times, is the opposite of woke. The other thing is that India is not looking for validation anymore like it once was, say in the ’90s, when Madonna wore the bindi and mehndi, and Gwen Stefani used the stick-on version to decorate her forehead like a Bengali bride. But in a highly connected world, where we appropriate products from each other’s cultural heritages sans context on almost a daily basis, what was the real reason behind this uproar? It could be because unlike other Indian icons such as the sari, the bindi has its roots in religion — similar to Rastafarian dreadlocks or Native American headdresses. So seeing it hijacked and commercialised as a vacuous indicator of spirituality or hippy fashion by the culturally uninformed might be construed as disrespectful, especially when the same trend is not always appreciated by foreigners when it is worn by an Indian or individual of Indian origin. By the early 2000s, as India was turning increasingly global, the youth and Indian advertising were distancing themselves from the accessory. But then, the bindi made an interesting comeback through TV. Its unlikely saviour was Ekta Kapoor and particularly her K-serials, as they came to be known. Many a trend was set by the chaste heros and heroines, as well as the omnipresent vamps, whose eye-catchingly unorthodox blouses and bindis were as much the talk of the town as their mannerisms and conspiracies. It wouldn’t be too far-fetched to say that the most popular of these vamps who ruled the small screen were much more fashionable than their ‘simple’, sanskaari adversaries — think Sudha Chandran’s Ramola Sikand in Kaahin Kissii Roz or Urvashi Dholakia’s Komolika (from Kasautii Zindagi Kay). Who can forget Dholakia twirling errant strands of her perfectly made-up hair, kohl-filled eyes blazing, hideously coloured lips (perhaps intentionally so, with a shade of lipstick meant to harden the features) curled into a dangerous sneer. Out of all the fashion trends established by the two and lapped up by the viewers — Komolika’s ornamental plaits, tube blouses and nose rings; Ramola’s mauve lipstick and garish neck-pieces — the most talked-about was certainly their bindis. Whether comical in their outlandish designs or symbolic of the complicated characters whose foreheads they adorned (think snakes and geometric shapes drawn to confound), they certainly accomplished the mission of being memorable, much like the devil in the Onida ads of yore. Another reason for the bindi’s lasting success in these sagas — that would air both in prime time and as reruns in the daytime — was the audience who consumed it, largely middle-class housewives. As urban India started favouring tattoos over bindis, the bindi found refuge among the older, more traditional segment, who still believed in its appeal. Far from belonging to a domain exclusive to cisgender women, the bindi has also been used as a tool of self-expression and empowerment irrespective of the gender one is assigned to at birth (or the sexuality with which one identifies), as can be seen from the way some individuals from the LGBTQIA+ community have adopted its symbolism. For instance, the 2016 picture book The Boy & The Bindi — written by Canadian author, musician, artist, professor and queer trans woman Vivek Shraya, in a bid to foster a more gender-neutral environment for children — narrates the tale of a young genderqueer boy who is obsessed with his mother’s bindi. Acting as a visual indicator, the size and shape of the bindi has also been used to create a perception of the good and the bad on screen, even for non-binary characters. So the viewer is likely to be, or at least start off being, sympathetic to someone whose bindi is demure, a metaphor for order, propriety and decorum. Like Nirmal Pandey’s cross-dressing dancer — a character alluded to as The Transvestite, a term now regarded as offensive — in the 1996 Amol Palekar film Daayra or, more recently, Riddhi Sen in his National Award winning role as the trans woman Puti in Nagarkirtan (2017), incidentally both positive characters. In both cases, the bindi is just a red dot or a tidy little version with no unruliness. But in the case of Sadak (1991) where Sadashiv Amrapurkar (also the recipient of the first Filmfare Best Villain award)powerfully portrays the malevolent transgender pimp Maharani, the bindi is more dramatic, a dead giveaway that the character is evil. Director Mahesh Bhatt and Amruparkar no doubt created a problematic reference by playing into a stereotype and immortalising it on screen. It’s used in a similar way in the K-serials, where the bindi can represent two sides of the coin. Its design can embody the traits of the character. So, it can be outrageous or in control and sensible, depending on whether it is worn by the villainess or the heroine. I still remember the delicate, exquisite Swarovski-studded bindis that my mother preferred; each one within a container of its own. They were nothing like the reliable crimson dots I had seen her pair with red-bordered white saris during Bengali Hindu religious festivities. But a decidedly atheistic outlook, an innate fear of being overdressed and an identity crisis common to many young urban Indian women made it difficult for me to embrace certain elements of our cultural and religious heritage. It was finally in college, as a Westernised youngster sporting multiple piercings and brimming with ambition and confidence, that I did reclaim it. To my surprise, I found the bindi lent itself splendidly to my boho-chic style ethos. And when I, as the prodigal daughter, finally found I could relate to this piece of my ethnic heritage, it was almost self-affirming. I could employ the bindi to reconcile my various different worlds and sync with a part of my ethnic, racial identity in a way I felt comfortable instead of having it pigeonhole me — and this felt like a homecoming of sorts. In that instant, the bindi transcended the realms of fashion to become something more. Look at it as an eccentricity, a style statement or an avenue to express one’s true self, for many advocates of the accessory, their bindis have become an inseparable part of their look and identity. Despite the many accusations it has had to stave off — backward, old-fashioned, uncool, outcast, taboo — the bindi has clearly stuck it out. For a 10,000-year-old custom, it’s doing pretty well. Oh, now when you look at it, it’s a package deal. ‘Usha Uthup’ means the sari, bangles, flowers in the hair, and the bindi on the forehead. A lot of people ask me, ‘Is this is a strategy, a marketing thing, positioning?’ All I can say is that because I come from a very middle-class family — and I keep saying that because it’s important — I saw my mother, aunt and sisters wearing it. So, I also did it. We all used to wear something called a chaand, C-H-A-A-N-D. I don’t know how you would write it in English because it will sound like the moon, but it isn’t. The chaand, in Tamil, is a liquid material that came in a little bottle. A glass stick with a small bulb-shaped tip accompanied it. So you dipped that in the liquid and then put it on your forehead. And then when the stick broke we would use a matchstick and apply the dot of colour with that. It started off as a small dot. Later, I started making designs with it. I used to use kumkum, the dry powder. And then came the time when I started singing and I really changed the whole thing up. Bindis in India also started changing around that time and by that I mean the material. We now had something called Shingar, which came in the liquid and then stick-on format and gave us so many colours. But before that, I used to use Camlin acrylic paint, and I would use the paintbrush. I would do it with different colours to match my saris. The size and shade kept changing because I started wearing different kinds of saris and colours but the bindi soon became a trademark. Usha Uthup’s face without a bindi is not acceptable. If I’m out in public and by mistake I don’t have the bindi on, if I had rushed to catch a morning flight to Kolkata and had thought, ‘I could do in the car’ but hadn’t, or had decided that I will wear it in the aeroplane and it hadn’t ended up happening, the airport staff in Kolkata will always ask me, “Kothaye? Tomar bindi ta kothaye?” (“Where? Where is your bindi?”) [laughs]. Babies and even the men notice it [pauses]. Everybody looks for the bindi. Of course, I don’t look at it as just decoration or a fashion statement but something more. The fact of the matter is that people look at it as a fashion statement. I look at it as something I grew up with. It is a sign of marriage among Hindus; widows don’t wear a bindi. But now of course it doesn’t make a difference if you’re widowed or married; it’s decorative. But at least for those five seconds when you stand in front of the mirror in the morning and touch the forehead with your finger that has the kumkum or vermillion on it — as I’m doing while talking to you just now — think about your inner self and the soul. Chat with your soul. Look into yourself. I often do a quick introspection of what has gone by the previous day. Nowadays, I order it, the big red, black or purple ones, from Mumbai, because I don’t get that size everywhere. Then I decorate it with the Bengali letter kaw. I use the trishul as well, to denote woman shakti. I got the ma in Marathi and the word isai, which means music in Tamil. For Delhi I got the letter da in Hindi. People don’t know this but I’ve also got the letters printed on my saris. Even foreigners and people from other regions, who don’t know what they mean, find it interesting and want to know more. I also have a bha for Bharat and I put it on when I’m travelling. Say, if I’m going to Gujarat or some place I don’t have a letter for. I wear it more prominently, happily and conscientiously when I’m abroad. For an artistic person, a singer or a dancer, it works, it really works. The letters, for example, were all me, it was my idea and nobody else has ever done it before. I got a lovely letter in Malayalam also, kaa for Kerala. It started with the video of the Kolkata song in 1996. Before I started doing the video, which had many big artistes in it, I got a sari printed in Bangla by Nanditadi (Nandita Raja) of the Kanishka boutique in Kolkata. For the visuals, I wanted the kaw to be on my forehead as well, just like it was on my sari. Actually, the whole thing started off with the thought that if we can wear a T-shirt that says ‘I Love New York’ or ‘I Love London’, why can’t we say ‘I Love Bombay’ or ‘I Love Delhi’ or ‘I Love Kolkata’ through our attire? This was long before T-shirts with such prints became trendy in India. Now, people look forward to what bindi I’m going to wear. And it has become a part of my sartorial statement.